New in Happy End this year! Champagne Bar – is a relaxing and pleasant place with warming animal skin decorations to sit on and the only bar that serves real champagne on the slope and offers the widest choice of wines and sparkling wines! 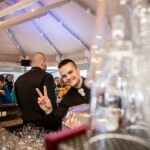 Unique services include a possibility of ordering champagne and wine in the form of “by the glass service” as well. Come to enjoy a glass of a delicious beverage served with a bowl of fresh fruit. The bar is located in the upper section of Happy End, next to the outdoor terrace. Its form and oval ground plan resemble après-ski bars on slopes. Wood and animal skins make it even more comfortable and cosy. 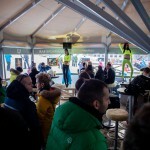 An exclusive bar available for everybody during or after skiing! The real spirit of the Champagne bar consists in a flawless offer of drinks and a pleasant atmosphere that makes every minute spent there simply unforgettable.